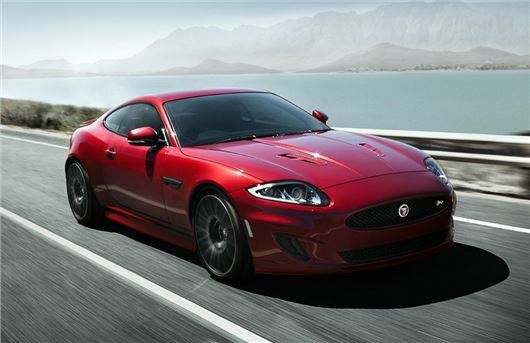 Jaguar has introduced two new special edition XK models. The XK Signature and XK Dynamic R are priced at £54,950 and £69,950 respectively with the first cars arriving in March. Both are available in both coupe and convertible bodystyles. The XK Dynamic R (pictured above) has a 5.0-litre supercharged engine with 510PS and gets the Black Dynamic Pack, which includes XKR-S suspension and a 10mm reduction in ride height. It has the Speed Pack, which equips the car with an Aerodynamic Pack and an increased top speed of 174mph. A Performance Active Exhaust is also standard. Acceleration from 0-62mph takes just 4.6 seconds and the Dynamic R also has Active Differential Control technology. Inside are new diamond sewn Performance seats in either ivory and charcoal soft grain leather with ivory contrast stitch or alternatively charcoal and red soft grain leather with red contrast stitch leather. Featuring integrated head restraints and increased lateral and squab support, the new seats hold driver and passenger securely and comfortably in place. The 16-way adjustment of squab, cushion, lumbar and bolster elements is supplemented by memory and heating functions. The interior jet suedecloth headliner is complemented with piano black veneers. The XK Dynamic R has 20-inch Vortex diamond turned wheels, with red painted brake calipers, along with the option of 20-inch Vulcan Gloss Black lightweight alloys. Both editions are available with a choice of paint colours – Polaris White, Ultimate Black, Stratus Grey, Italian Racing Red, Dark Sapphire and British Racing Green. The XK Signature (below) focusses on luxury and comes with luxury seats in either ivory or charcoal soft grain leather plus canvas suedecloth headlining, figured ebony veneers and bright metal sport pedals. It also comes with a reverse parking camera and 20-inch Kalimnos alloy wheels. Power comes from the 5.0-litre V8 engine with 385PS which delivers 0-60mph acceleration in 5.2 seconds for the coupe and 5.3 seconds for the convertible. It's fitted with a six-speed ZF automatic gearbox with steering wheel-mounted paddles while the top speed for both is electronically limited to 155mph with emissions of 264g/km.